The Tyrone boss was diagnosed with bladder cancer in early 2015. TYRONE MANAGER MICKEY Harte received the all-clear last December after battling cancer since 2015. Speaking in today’s Irish Examiner, Harte revealed that he was diagnosed with bladder cancer in early 2015 and underwent extensive treatment for a period of 30 months. “That was a tough year (2015), that year,” Harte told the newspaper. “A very tough year. Thanks be to God it got discovered in time and I got it removed. “Then I got treatment, like chemotherapy, only it was directly into my bladder, it didn’t go through the whole body. But then it wasn’t working the first time around. And then it didn’t work the second time around. “I remember being up in Belfast and them telling me there’s a 66% chance of it working the first or second time but after that it goes down to 18%. “Thanks be to God though, that third time, it worked. So I didn’t have to get the whole bladder out and get a reconstruction done. The only game he missed due to the treatment was Tyrone’s final league game of 2015 against Kerry when a draw consigned them to relegation to Division 2. Harte will lead Tyrone into the All-Ireland SFC final for the fourth time on Sunday, having achieved victory on his last three trips to the decider. Email “Mickey Harte reveals he is in the clear following cancer treatment”. 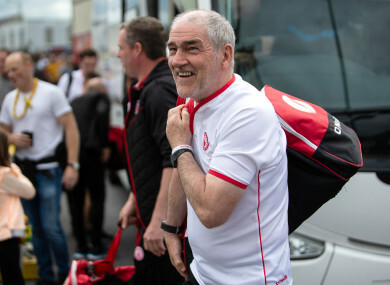 Feedback on “Mickey Harte reveals he is in the clear following cancer treatment”.